When we first moved into Our House (OH) I worked quickly and without much thought, to try and make a start on the garden. I was driven to get things into soil by the onset of Winter 2012 (which, as you recall was one of the longest, wettest and coldest we’ve had in recent memory). It is only as Summer lazily rolled around, and that I’ve stopped sowing and planting, (and, even, been overtaken by the weeding which needs doing); only now, that I’ve started to re/consider my first initial designs for the plans. I grew up near to one of the most famous gardens in the world, Sissinghurst in Kent, and thought of Vita Sackville-West as having been an intriguing and inspiring figure since I first visited her home. She was, of course, infamous in her own time and that, together with her charismatic column writings, is compelling reading for a young gardener. She is inextricably associated with the glamour of the monied classes, who could afford to waft around overseeing or implementing themselves the construction of fabulous designs and – the crucial thing – could afford to command LAND in the first place. Of course I’m envious of the perceived luxury of such a life, and wistful to think of a time when there seems to have existed more available time than nowadays (perhaps because there were more people on hand to share the work). I’m currently reading Agatha Christie’s Autobiography in which she evocatively describes a childhood surrounded by servants; dinner parties with 10 courses as the norm… and a vast garden and area of woodland… Now what is glamorous, if not all that? In my humble opinion Vita’s White Garden was one of the best parts of Sissinghurst, because it is so strongly evocative of its creator’s personality and intentions (still?). It’s immersive, famous, – and romantic. But the point is ever since I was 13, I’ve always wanted my own ‘Land’, and to design my own (almost) White Garden. And now I have begun! The obvious place for this was the concrete courtyard directly behind the house. But in June the large hybrid rose already long-established in the raised bed down one wall, bloomed blood red! and I was further hampered by large swathes of pink and red Valerian also in this raised bed. I’ve always thought I hated Valerian, but standing in the summer half-light basking in the heat coming back off the walls, the warmth of this colour flooded everything and I decided it is wonderful stuff! Good thing too, as it has self-seeded everywhere! I could move it, or am considering creating a garden of two half sides; one of white; one of reds. And the good news is there is a white Valerian! Initially I didn’t want to consider a rose massacre but now I’m thinking of cutting the old boy hard back this winter and trying to move it too. Everything in that bed needs taking to task, digging up, and dividing; the raised bed is so free draining that I know it would be beneficial to stick some good humus and fresh top soil too. And I need to know if it is a concrete box, and has a bottom or if it drains into the ground. So, while everything is gently beginning its slow wind-down towards Autumn, I’m getting planning. The first job is to get some very nice guys Kevin and Dan to crack and dig out all the nasty concrete (see 'Renovations') so I can create another green canvas, and cut out flower beds. 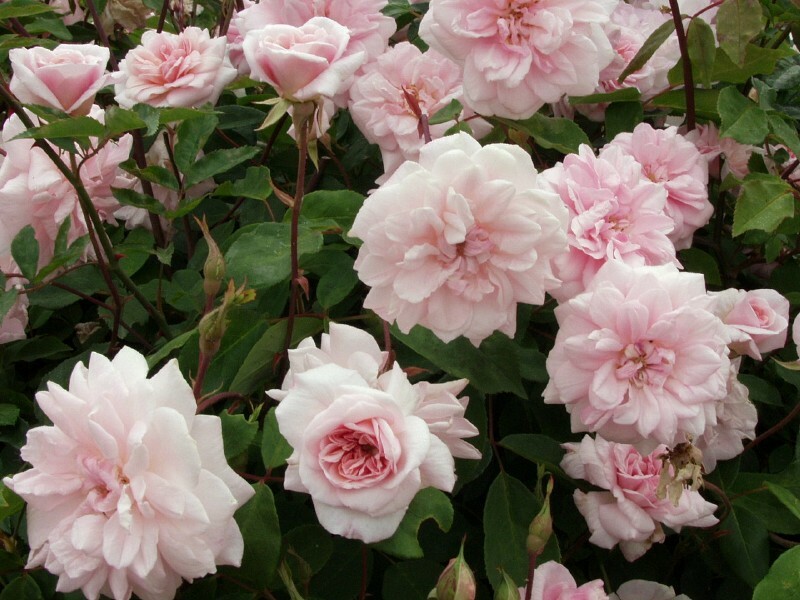 I’ve already bought two heavy duty climbing roses from David Austin, which will get up a 3-storey house. As the back of the house is almost half a storey beneath where ground level starts at the front of the house, there is a bigger area to cover here. My critera were: in the pink spectrum (before White Garden dreams were grasped); repeat flowering, and capable of a lot of growth around 12ft. David Austin’s man said there were very few options, and recommended Madame Caroline Testout and Cecile Brunner. She did actually flower this first season, which was so nice to see (although I know I was naughty to let the bud set, as it should have been pulled off to encourage the rose to put all its energy into new roots and strong growth). The second stage is to build a brick wall between the Garage and the Coal Shed, which will have a gate in it. I had initially planted a Holly hedge, but some time in March / April our very good Neighbourhood Watch TeamJohn&Lynn told us they’d ‘seen off’ some men and a woman who were actually walking around our back yard, eyeing up scaffolding and ‘scrap metal.’ I didn’t like the idea that anyone could walk down from the road and down behind the house and into the garden. It also makes it impossible to think of having chickens, or a dog or visiting children, running free. So we’re having a Regulation Height Wall put up (after some very colourful quotes illustrating how much certain Builders dislike the art of bricklaying). And I will place a trellis across the top just to cheekily create some extra height. I’ve got two fruit trees which are poised to go into the ground; one is a Cherry, Stella which I bought on a whim from Homebase and which has not flowered and has oozed resin all spring and summer as though it’s mutely injured. I don’t know why! I haven’t come into contact with fruit trees before so I’ve got to read up. It is in a massive pot and has put on a lot of growth and survived my attempts to keep it in check (I read you must prune Cherries during the growing season). I am going to train it into a fan against the Garage wall, which catches much afternoon sunshine and is warm. However as we face West, I’m hoping it won’t be too windy for Stella. Time will tell. The other fruit tree is very special to me. I think of her as being an old lady as I’ve had her a long time, but she is only now reaching 1 metre in height: she is a pomegranate my late Grandma grew from a seed! And because I can’t get another one with these emotional associations I’m hesitant to put it outside. But there is this great hot wall, on the back of the Coal Shed, which, beneath the rose which I’m planning, will be the perfect site. It is draining away on the slope, so it won’t have to put up with any water logging (winter or any other time). I am thinking of risking it, as once the wall is up it will be in a sheltered nook.